Download this guide to learn how to best narrow your focus to the most relevant metrics, and create strategic dashboards that bridge the gap between strategy and execution. Strategic dashboards are a great “at-a-glance” tool to help leaders make informed, data-driven decisions. Your dashboards should create an insightful and succinct story around the success of your key initiatives; however, in an attempt to track everything, organizations often create an environment with no strategic focus. 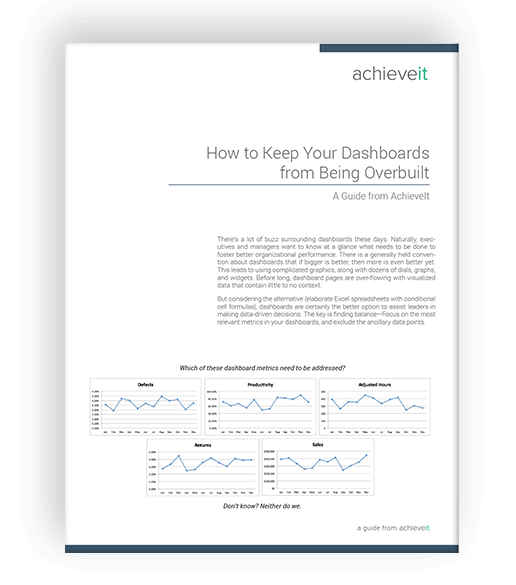 Reasons why your dashboards may not be effective. How to create results-oriented dashboards. Steps to right-sizing your strategic dashboards.